From the elegant surroundings from days gone by to the proper way each coffee is delivered to your table, the coffee houses suspended me and held me in this elegant world of a time that seems to be disappearing. From the moment I opened the door, I felt like all of the hectic noise in my head slowed down to ‘waltz time’ and I could relax. This was the perfect kind of slow travel. Sit, relax, drink coffee, eat some sausage, listen to music, read, and repeat the next day – that’s how to visit Vienna. I decided to ignore most of the ultra popular coffee houses listed at the tourist board in exchange for some lesser-known ones recommended by friends. 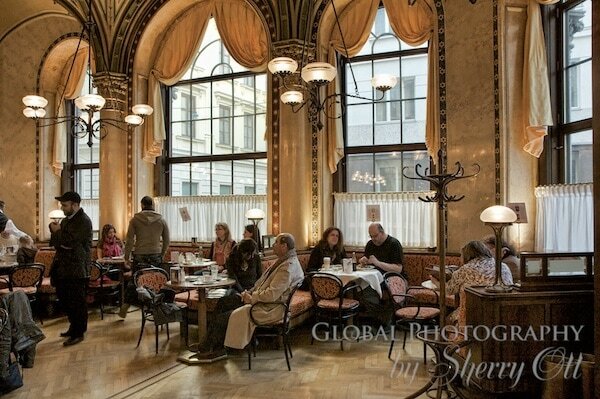 I was in Vienna for a week but managed to visit a coffee house a day. Café Pruckel – I stopped here twice…definitely my favorite! 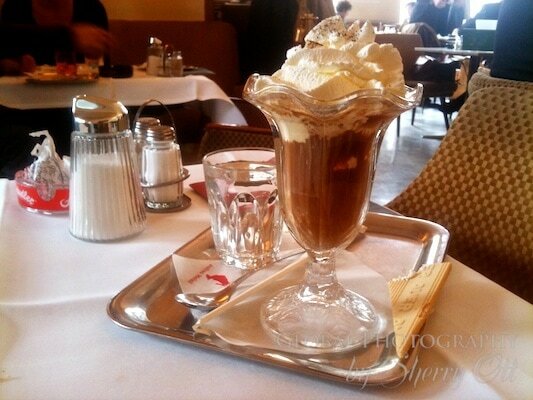 Café Ritter – amazing strudel! Each café served coffee and food on dishes with their name on it. I became fascinated with where all of the namesake china came from! I loved simply analyzing the font they used on the dishes which seemed to mirror the décor and personality of the house. Great ... It could be magnific for a person who just lives on the mountains, without connection with big cities like Viena, to enjoy a coffe like at near or beside of blue lake.